Cardboardia is a country without territory. It was founded 10 years ago and we're celebrating our tenth anniversary this year! Our state is independent and not connected with any natural resources, but people's creative energy! We are always search for new creative energy supplies in humanoids form! Cardboardia - State of Mind! How to found creative energy near river? 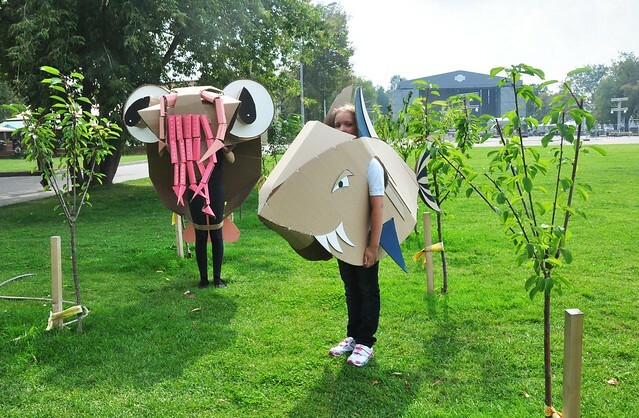 At Marine Laboratory of Cardboardia Personages of Cardboardia will research specific aspects of life near river. During 4 days before Themes festival, together with local artists we will create fishing game connected with absolutely real «Сardboard Fish Market», where gamers can try to sell (or change for creative or mood energy) they fish catch on auction. During 16 September we will organize couple of Cardboard Boats Racings, it will be very dangerous sport game tournament’s available for adults after 6 years old! 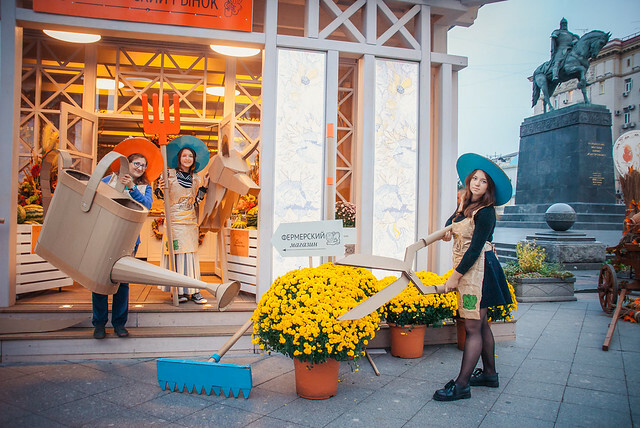 In the end of festival we will propose everyone try to imagine yourself as a fish or fisherman’s! Lets see can we organize epic fishing with huge paper net! Lets catch up with each other live 16 September! And you can just come 16 to ThamesFest from 12-00 to 17-00. Free access for any ages! Cardboardia is a country without territory. It was founded 10 years ago and we're celebrating our tenth anniversary this year! Our state is independent and not connected with any natural resources, just people's creative energy! We are always searching for new creative energy supplies in humanoid form! This year to uncover new supplies we are developing the new science of Foolosophy. Personages of Cardboardia in September 2017 will be launching a unique experiment! Absolutely inexperienced in biology and neurosurgery, Tyran of Cardboardia and Minster of Education will try new, not direct contact technology to get straight into the minds of people and plant the seeds of good mood for everyone who wants to become a subject for the advancement of Foolosophy! Together with all experimental specimens we will cultivate seeds and carefully grow it during the next 12 months from Festival of Thrift 2017 to Festival of Thrift 2018! In September 2018 we are planning to come back, check the results and harvest pure happiness! Cardboardia - State of Mind! at Town’s countryside during Summer in Southside festival! Cardboardia is a country without territory. It was founded 10 years ago and we’re celebrating our tenth anniversary this year! 2017 has another very important date in world history – the one hundredth anniversary of the October Social Revolution in Russia! We’ve decided to combine these 2 remarkable and historical dates and create a series happenings and celebrations throughout this year. 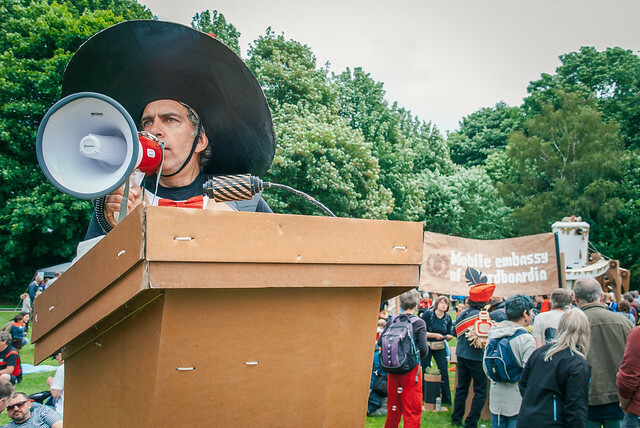 The first Mobile Cardboardia Embassy of 2017 will open in the UK in Birmingham as part of Southside Summer Festival. One of the best texts about the repercussions of the revolution in Russia was ‘Animal Farm’ written by George Orwell, a British author. 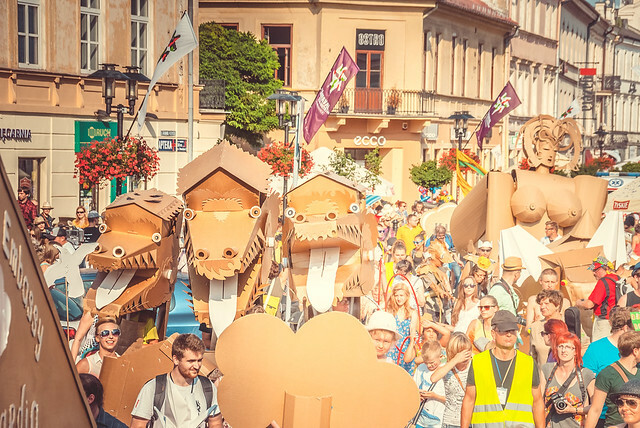 We've decided to create a Cardboardia Animal Farm – with pigs and fences, combining the mixed feelings of safety in cages and with closeness of death. Like a bright final we propose to form columns of not prepared demonstration in glory of George Orwell! We are planning to bring the countryside into the urban city centre environment, near the Hippodrome right on Ladywell Walk! We will be making masks to feel like counterfeit animals and designing cardboard garden tools to become fake farmers! Only we will won’t be making our Animal Farm to grow food, but to cultivate crazy ideas together! You too can become a Cardboardia personage and farmer and join our team in advance to help us develop our unique town based farm! To join the Cardboardia Laboratory for 5 days please fill in this form, we look forward to meeting you! 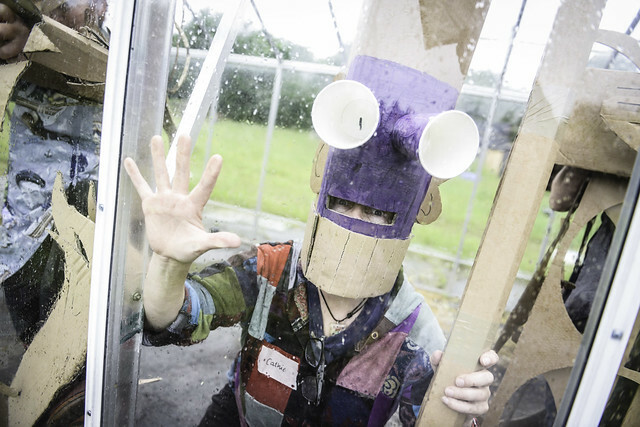 Cardboardia laboratory from 14 June at Studio 5 (prior registration needed). From 11am to 20pm.